Saluton! Thank you for joining me on this Chats episode of Succotash, the Comedy Soundcast Soundcast. 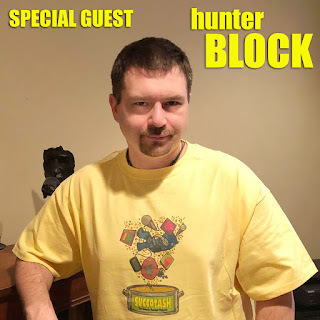 My guest for this episode is someone I've wanted to have on since I began hosting duties…and that someone is none other than Hunter Block, my co-host on Anti Social Show, a soundcast that I've been recording with him for nearly two years now. I always have a good time recording with Hunter when we record for Anti Social Show. If there's one bit of info I've absorbed from listening to so many different soundcasts over the years it's a particular similarity of nearly everyone who commits their voices to digital posterity in mp3 format…and that similarity is how at the beginning of what will become the life of a soundcast, so many of its creators and contributors have absolutely no idea how a show is going to evolve or how long they will continue to make and post episodes. I'm not talking about radio personalities who archive their shows, I'm talking about people who just decide to add their voices to the ever-growing pool of audio personalities who you can choose to spend part of your day with. In addition to my conversation with Mr. Block I've also got a DOUBLE dose of raging moderate Will Durst's Burst O' Durst segment, plus this 'sode is brought to you by our ever-present sponsor Henderson's Pants. Before I get into my interview with Hunter I'm featuring a clip from Illusionoid, a soundcast out of Toronto, Canada, that recently launched its 10th season. It should sound familiar to long-time Succotashians, as we have not only been featuring clips of the show for many years, but previous host and current Succotash executive producer Marc Hershon interviewed the cast — Paul Bates, Lee Smart, and Nug Nahrgang — back in January of 2013 in Epi48 when they were visiting San Francisco for the S.F. Improv Festival that year. The clip Marc provided for us is from the second episode of the new season, entitled "The Undersea Pawns." Well, there you have it. Who knows what the future brings? Sasquatch, that's who. But they're moody and reclusive so it's difficult to gather their predictions with any degree of regularity. Anyway, until next time I bid you a fond gxis poste and, if I could trouble you to do so I'd like to gently implore you to please…pass the Succotash.